As part of my ongoing development as an artist I need to set some goals and work towards them. Finish at least one art project a week. Post to this blog at least once a week. Here's the fine print defining what that means. Art projects don't have to be big but they do have to be complete. For the next six months, getting something done to upgrade the studio is going to count as a art project. That way I can take some time to continue to work on the studio projects that need to be done before I can tackle some of the art projects I have in mind. At the very least, the post should tell you what art project got done. Weeks start on Mondays because it's easier not to split the weekend. That means I've got til Sunday night to finish something and let you know about it this week. More than one project or post in a week doesn't mean I get to skip the next week. I've found that just deciding to do something isn't enough to make sure I do it. There's a devious little part of me who insists that just because I decided something doesn't mean I can't undecide it. He tells me, 'No one will know. It's OK to skip it this time.' And then I do. Once that happens, it's easier the next time. Pretty soon, the resolve is gone and it's all over. No, if I really want to commit to doing something, I have to make it embarrassing to fail. What can I say? It's not a trait I'm proud of but it seems to be ingrained. I just have to learn to work with what I've got. If I miss a week, call me on it. Let me know that I messed up in the comments. I give myself the right not to finish an art piece or post to the blog in a given week if there is a real emergency. You know, if I'm truly ill or there's an emergency in the family. In that case, however, I have to tell you all why it happened. And you guys get to tell me if my reason is sufficient or not. Don't be shy about it. The embarrassment is part of the way this works. Gauntlet's down, self. Time to get to work. There's all sorts of things that I could write about but this has to go first. My new heavy chasing hammer from Nechamkin Silver Studios arrived today! 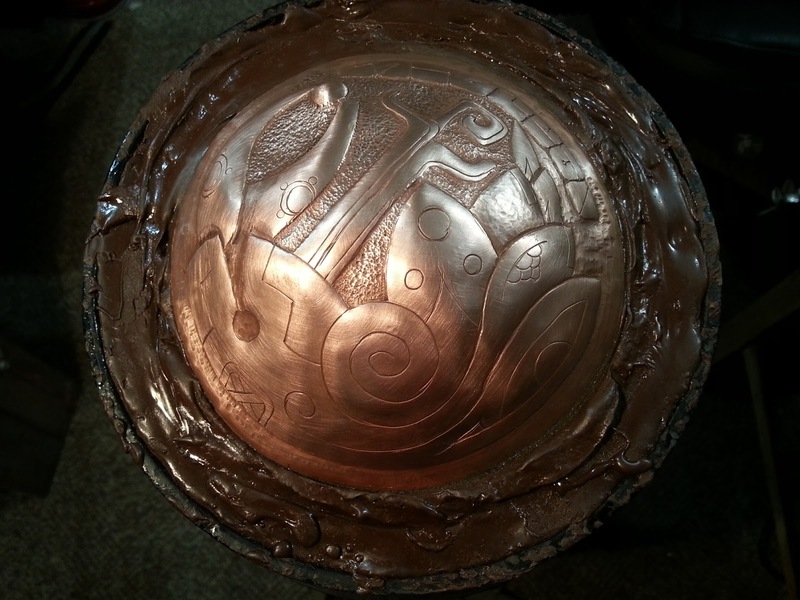 I've wanted one of these since I took a chasing and repousse workshop from Liza Nechamkin two years ago. At the time I bought her standard chasing hammer and the standard set of tools plus the matting tool set but couldn't afford the heavy hammer. So when I saw that they were going out of stock I splurged and ordered one. Isn't it sweet? 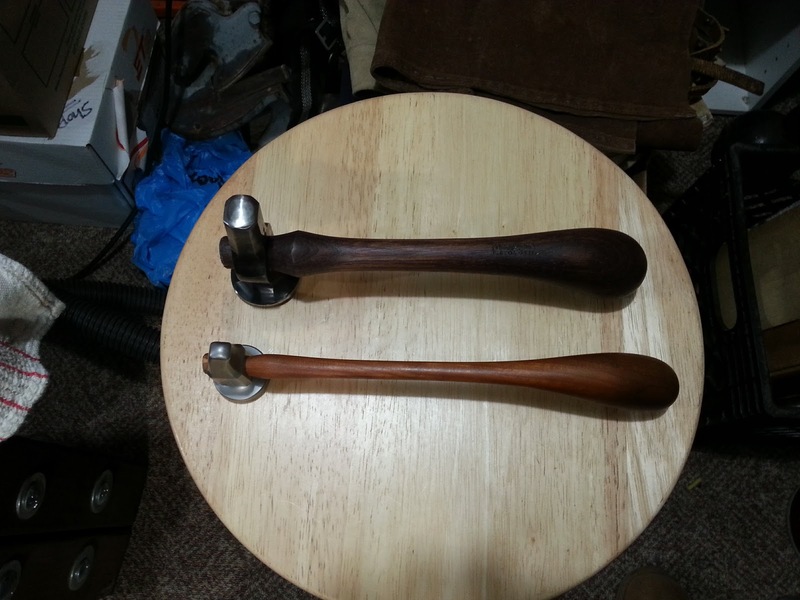 Walnut handle, forged steel head with a lovely blued finish. Works beautifully too. 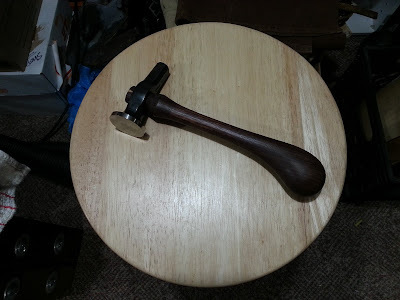 Fits my hand as comfortably as the original Nechamkin pistol grip hammer but the extra weight and stiffness of the handle mean that I can strike a deep mark with much less effort. Less effort makes for greater control and longer working time. I love it. 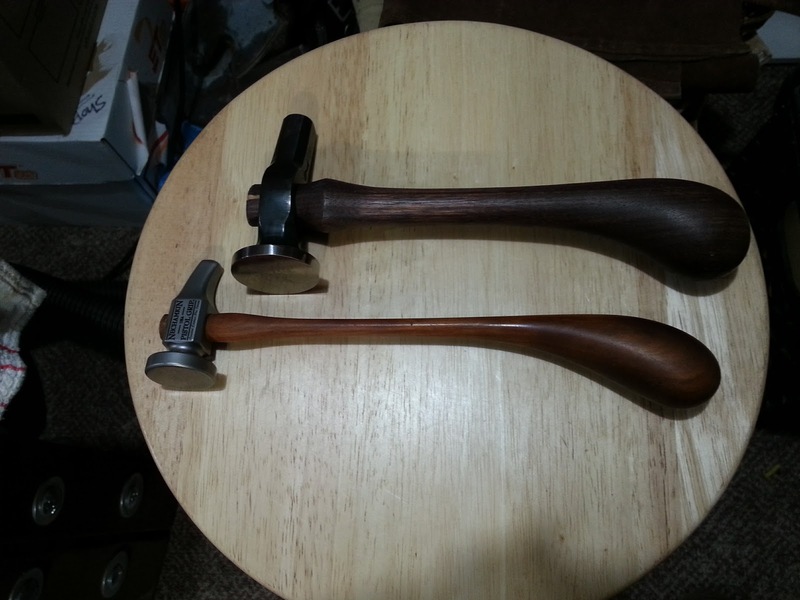 Here's a comparison with my other chasing hammer. The two vessels that I posted about on the 20th are getting closer to done. 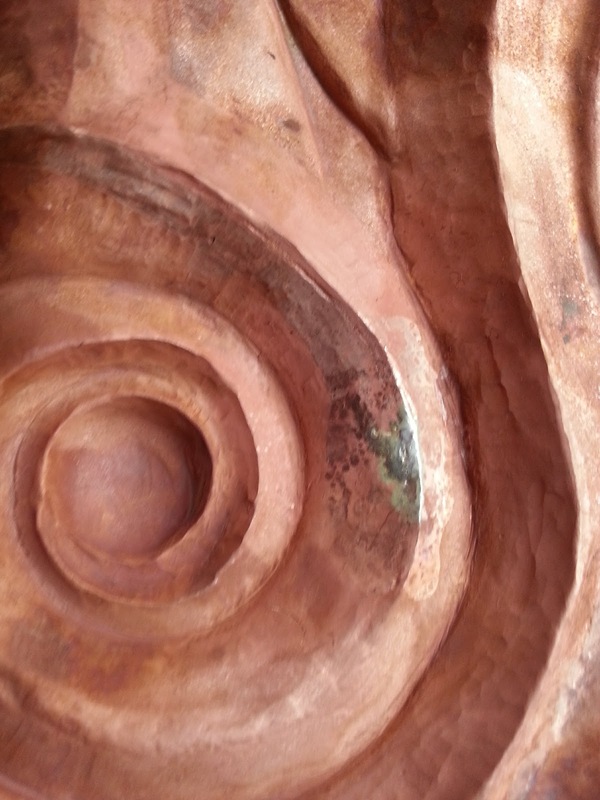 Here's the high relief vessel. The shapes are lots crisper now. I soldered the hole that it had and was able to chase over the repair. So it's a good solid repair. The solder repair from the front. Practically invisible. What remains is to decide how to handle the eye. 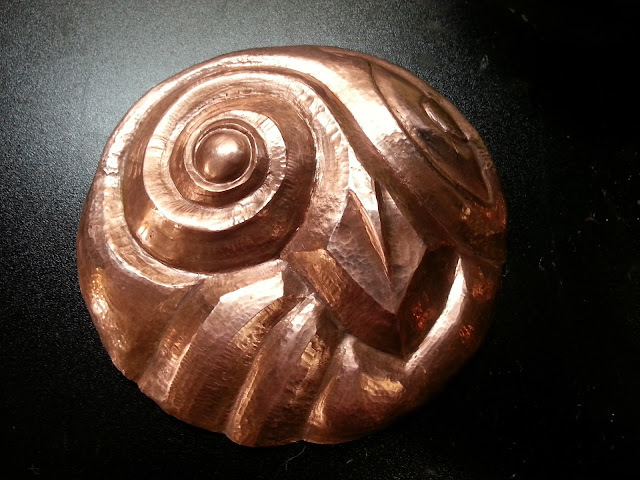 There are some dings in it that interrupt the smoothness of the plain copper surface. If the metal were thicker, I'd sand and buff them out. But that won't work in this gauge metal without making it too thin. So I need to chase a texture into it that will obscure the dings and, ideally, enhance the look of the piece. That will have to wait for a new day and a fresh eye. 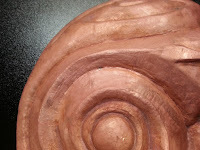 This is where I've gotten to on the low relief one. There's some more texturing to do but it's pretty close to the point where all the hammering is done and it's time to patina it. All in all, I'm pretty happy with the way these are going. They've presented some interesting challenges and I've learned a good deal from them.